O.W. Wolters said some Filipinos sailed 800 miles across the seas to bring pearls which the Chinese greatly valued at their trading post in Funan in ancient Vietnam around 300 A.D. The story may be true but the trading could not have lasted long enough as what the Chinese have done to this day. The late historian William Henry Scott opined that although Chinese goods abound in the Visayas in the 16th century, he doubted that the traders themselves came. Humabon, Cebu’s ruler in 1521, ate from porcelain wares based on the account of Antonio Pigafetta, chronicler of Portuguese explorer Ferdinand Magellan. For Scott, this did not prove that the Chinese were indeed in Cebu then simply because the Spaniards didn’t mention them. Years later and despite the report received by the Spaniards that eight men from the Magellan expedition were sold to the Chinese, Scott remained unconvinced of their presence simply because the Spaniards only heard of it and did not actually see the Chinese. For Scott, the Chinese only came, at least, in the Visayas in 1569 when Miguel Lopez de Legazpi captured a Chinese vessel and its crew somewhere off Panay Island. It could be true but it could also be that the Chinese were in the Visayas in 1521 but were just elsewhere among the many islands. The Spaniards were also not that many to observe the whole Visayan Sea. 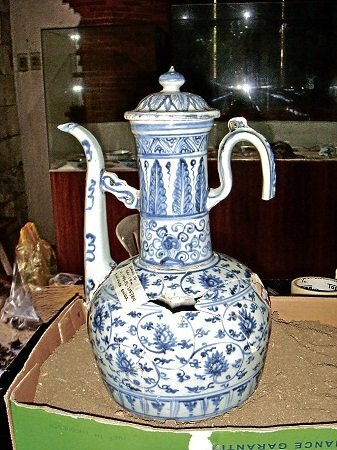 A restored very rare blue-and-white Ming dynasty ewer is similar to that recovered by the underwater archaeologist Franck Goddio at Lena Shoal Shipwreck off Busuanga Island. Archaeologists say the recovery of such kind of porcelain ware speaks volumes of the trade that took place in Cebu even before the Spaniards arrived in the country. It could be true that some of the porcelain ware recovered in many parts of Cebu, for instance, which date back to the Sung and the early Ming dynasties, were brought by other traders such as the Annamese and the Siamese. But it was also possible that a majority of these were brought by the Chinese themselves. Just because the Spaniards didn’t see them until 1569 didn’t mean that they had not been trading with the Filipinos, the Visayans in particular. What should be taken into account are the many years that the Spaniards were not in the Philippines. For Edgar Wickberg, it was only when the Spaniards started the galleon trade that Chinese migration to the Philippines occurred. This happened when the Chinese saw the opportunity to export Chinese goods to Mexico. Silk and luxury goods were brought to Mexico and Mexican silver were brought back by the galleons as payment. In both deals, the Spaniards gained as middlemen. In 1603, or 32 years after the founding of Manila, 20,000 Chinese were already residing there, compared to just 1,000 Spaniards. Accounts of the presence of Chinese traders in the Philippines before 1569 may be found in Chinese archives and just waiting to be uncovered. But for now, the abundance of porcelain ware used as grave goods by our ancestors may indicate that they had been in the country for a long time. The recovery of many Chinese porcelain ware in Cebu, being an ancient place, could show that the Chinese traded with Cebuanos even as early as the 12th century. In the present downtown area, archaeologists Karl Hutterer and Rosa C.P. Tenazas unearthed burial sites that yielded Yuan and early Ming wares, together with other Southeast Asian ware. Another site in Fort San Pedro in 1973 yielded Ming dynasty ware. 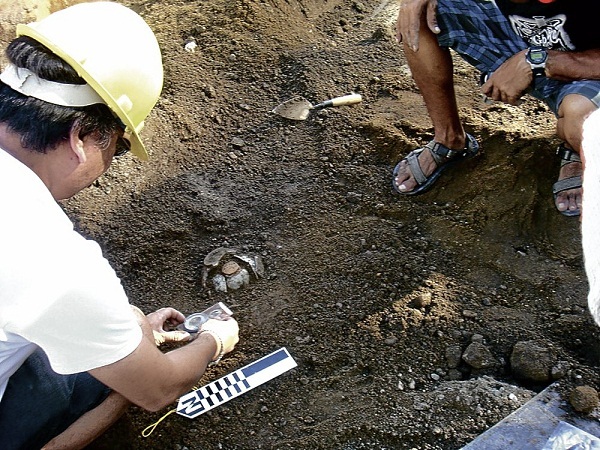 Archaeologists also found more porcelain items during the construction of the multibillion-peso tunnel that connects to the South Coastal Road in 2008. Some of the items were identified by archaeologist Jojo Bersales as Zhangzhou-type. It is possible that some had been accidentally unearthed or looted by antique hunters in the same vicinity. For sure, trading was not only confined to Cebu City since certain blue and white wares were recovered in other towns even outside Metro Cebu. On Bantayan Island in northern Cebu, blue-and-white porcelain ware were still being washed out to the shore in a coastal village, especially after heavy rain.